Will even larger OLEDs than this 27-inch show up at CES? Are you tired of the same old plasmas, LCDs and projection HD TVs that seem to dominate your local retailer's shelves? If so, you'll be interested to know that at CES next week a whole new group of HD TV technologies are to be unveiled to whet your appetite. According to reports, laser TV sets should finally be making a public debut with Mitsubishi having announced a formal unveiling of the technology. Laser TV is a projector TV technology that's ostensibly lighter and less power-intensive than LCD, and covers 90 per cent of the visible colour spectrum. According to Mitsubishi, it had planned to show off its new technology sooner, but unforeseen delays necessitated the January announcement. Beyond that, larger OLED screens are expected to make an appearance at CES. The oft-rumoured SED HD TVs, which have been hit with a number of legal and technical obstacles, could show up at the show too, although the chances of that actually happening are diminishing by the day. Of course, older technologies will still be represented. 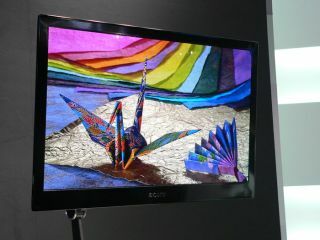 Rumours suggest LCDs will make a splash at CES, finally hitting the specification level so far only witnessed in high-end plasmas. Meanwhile Pioneer -- one of the world's leaders in plasma TV technology -- will show off its new Kuro displays, which offer extremely dark blacks and a wider colour gamut.